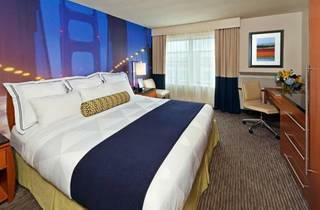 Offering a fitness centre, Hotel Zephyr San Francisco is located a short 300 metres from Pier 39 Fisherman's Wharf. Free WiFi access is available in this waterfront hotel. Each nautical-themed room features fishnet-covered light fixtures and porthole-style windows. A satellite TV and free WiFi offer in-room entertainment. Featuring a bath or shower, the en suite bathrooms come with a hairdryer and free toiletries. Extras include a refrigerator, desk, a safety deposit box, and a laptop safe. Select rooms offer stunning views of San Francisco Bay. At Hotel Zephyr San Francisco, you will find a 24-hour reception and a mini-market. Other facilities offered at the property include a shared lounge, a games room and a ticket service. An array of activities can be enjoyed on site or in the surroundings, including cycling. The hotel is 800 metres from Lombard Street and Ghirardelli Square. San Francisco International Airport is 21 km away.